I was super excited to race Zot Trot up in Irvine this past weekend. Not only would it be my first triathlon on the triathlon team (albeit a reverse one), but what a great excuse to not study for midterms! After getting lost (slightly) on the way up, Jake and I met the rest of the team at UCI Saturday afternoon to preview the course. I had been told by numerous people so far that this course was very challenging so I was anxious to see what it was like. And indeed with obstacles such as sharp turns, mud, strewn shrubbery, and even worse hills, I wasn’t feeling too hopeful about my performance the next day. To make matters worse, it was supposed to be foggy the next morning! Eager to boost my confidence, I loaded up on some delicious fake chicken and even deliciouser Trader Joe’s bread (carbo loading yo) that evening and settled in at Jason’s house for the night. We had to wake up at 4:20 (not the fun one) the next morning. I’m just now realizing that triathlon isn’t the best sport for people such as myself who like to sleep in. Nevertheless, I was eager to get to the race so after stress-eating a few more slices of bread and a couple bagels, we were on our way. Much to my delight, the weather was clear and very much fog-free when we arrived at the race. Feeling slightly more optimistic, I headed over to transition to drop off my bike and swim stuff and then warmed-up with the team. 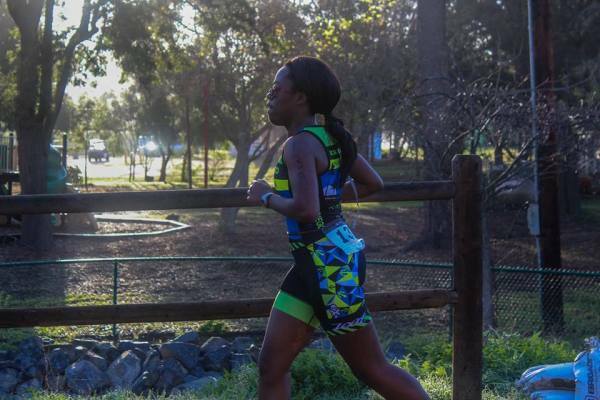 My strategy going into this race was to take the run out hard to get a good position because I knew I was going to be slow on the bike and even slower on the swim. After we were done warming-up and previewing some of the last minute changes to the course, we all lined up on the start line at 7. With a timid yell from the race director, the race was off! Our team had managed to get the very first position on the start line so it was a straight shot to the first turn on the wet soccer field. This proved to be useful as within the first couple hundred meters of the race we had 3 guys leading the run! 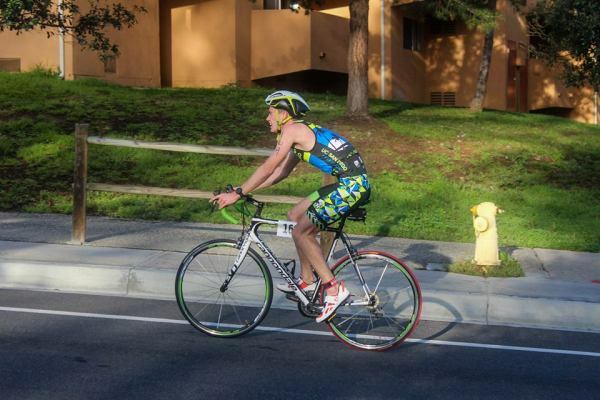 Eager to create a gap and exhilarated by being up front, I started to increase my pace. After we had cleared the treacherous jungle section of the course through the shrubs, Dustin and I had managed to gain a slight lead over the other guys. Halfway through the 5k we had reached the downhill sidewalk section of the course and I was feeling pretty good. That’s when we took a right turn and ended up on this steep, curving hill. 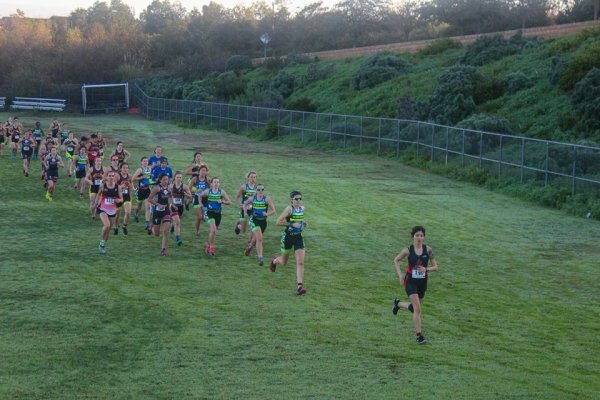 Upon seeing this I was extremely distraught but remembering all the mile repeats we had done up that stupid hill at UCSD, I thought to myself “This is nothing!” and pushed myself up and over the hill. After that not much of the run was left and by the time I had entered transition, Dustin and I had about a ten second gap over the next guy. Ready to take advantage of this, I rushed down the row of bikes in transition frantically looking for mine which I had inconspicuously marked with a blue towel. After almost passing it, I went to grab my bike only to realize that I had forgotten to clip my shoes into my pedals before the race! I frantically put my shoes on and then proceeded to knock the helmet off the guy’s bike next to mine. Wasting precious seconds to put it back (because courtesy), I rushed/duck-walked to the mount line just as Barry was exiting transition. If you ever want to be as colorful as Nathan, you can start by getting some sweet red tires. I quickly leapt on to my bike and started pedaling like a mad man to make up for the time I had lost in transition. Barry quickly passed me up the first hill and as we approached the first 180 degree turn I could already feel my legs burning from the run. The four laps went by achingly slow and by the end of lap two, my calves were screaming at me to stop biking. However undeterred by my fatigued muscles, I managed to finish the bike without losing too many places which I was proud of. As I approached the transition area, I removed my feet from my shoes to get ready to do a flying dismount, confident that I could pull off this maneuver after only practicing it for a couple minutes the day before. I successfully removed both feet from my shoes but before I could dismount, my left foot slipped off the shoe which started scraping on the street. I was still a couple feet away from the dismount line but I was now moving at like 2 MPH. Not wanting to be disqualified in my first triathlon, I scooted/rocked my bike across the dismount line and I quickly scurried back into transition area for the swim, eager to get away from the disapproving and confused looks of the race volunteers. I dropped off my bike (after almost missing my spot again), grabbed my goggles, and quickly headed for the pool to begin the swim. I’m definitely not a fast swimmer, especially I’d say after running and biking. Even though the distance had been reduced to a mere 250 yards, I had a feeling that this would be a very un-dramatic finish to my race. I quickly jumped in to the pool but in my rush I jumped too far and missed the wall! I quickly rose to the surface and started swimming but because I had no momentum and because I was exhausted from the bike and the run, I was barely moving. Trying to get in a rhythm, I thought to myself: “This is what drowning must feel like.” Thankfully after only 10 laps in the pool and I’m sure what was one of the slowest 250s I had ever swum, I exited the pool and crossed the finish line! I made it! 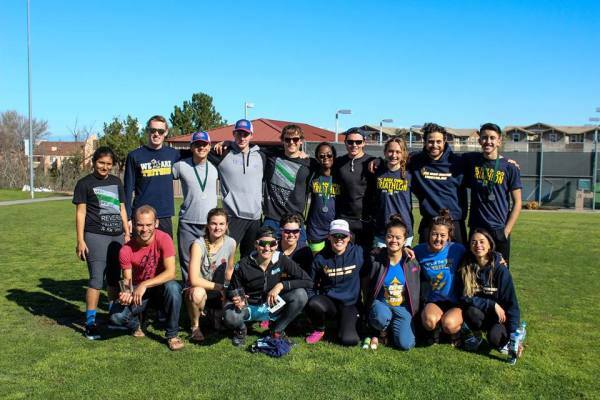 I had a super amazing experience racing at UCI with my teammates (who all did amazing) and completing my first (reverse) triathlon with the team! Even though I had missed a few turns and could definitely improve in some areas, I had a great time and I can’t wait to do it again next year! 7:30 am. Getting ready for the triathlon I was going to do tomorrow by packing at the last minute. Bad start to what was going to be an awesome weekend. I was ready to go by the time my awesome driver, B, picked me up at 10:30. We were off to Irvine! We got to Maggie’s house and hung out for a while, pretending to do homework with Ella, Barry, Vivien, and Maggie. We really hit our stride about 30 minutes before we had to leave (We all actually started working). We got ready for the pre-race practice and left, me and B beating Ella by a few minutes. Yes! The pre-race practice was good and ensured that I wouldn’t get lost on the bike course.  Then after that, we got dinner. After that was all said and done, B and I headed out to Jason’s house, along with Imran and Esme, for what would be a very early night. We hung out and talked and ate cookies (thanks Jason and his fam!) until about 9ish, when we all went to sleep. 3:45 am. I wasn’t ready, nor would I ever be, but the triathlon was happening today. I got up before my alarm in anticipation (really, I just had to pee). We ate breakfast and got dressed and headed out around 5 am. Still wasn’t ready. We got there, and B and I went to put our bikes in transition around 5:30 am. We went for a pre-race warmup with most of the team around 6:10 am. After that finished around 6:30 am, I went to the bathroom one more time and headed to the start. I still wasn’t ready and butterflies were in my stomach. I was really nervous, and still am even as I write this. We watched the guys start, and then were waiting on the line. We had one minute left and Ella says, “Can we hurry up because I have to do my homework!” We all start laughing; I’m not nervous anymore (thanks Ella! ), and the race starts. Lesson learned, “reverse triathlon” does not mean bike helmet goes on backwards. The run sucked, and the hills made me hate life, but then it was over. I was in transition and just shoved my helmet on my head and put my feet in my shoes. This resulted in my helmet being backwards for the duration of the ride, which Kim informed me about, but I didn’t want to stop and fix it. The bike was awesome and filled with exhilaration and happiness whenever I passed someone, and going down the hills was the BEST thing ever! Then I was done with the bike, and kinda sad, but also happy it was over. On to the swim! I was nervous, but Barry was there, helping me put my bike on the rack, and Katie was telling me where to go. Then I had to get in the pool. I still wasn’t ready for this moment, and it was staring me in the face. I got in and managed to finish the swim, and then a huge smile was on my face as I finished the race. Everyone was cheering for me the whole way, and you guys are all awesome! It was cool seeing people get their awards. I had no idea everyone was that good. Then after the awards, we went out for lunch, and I passed out on the hour drive back to UCSD (sorry B!). It was a great experience, and having everyone there made it better. Everyone did an amazing job!